Your 3.5-acre aquatic experience Opens Soon. Open for the season: Saturday, May 25, 2019! The FlowRider® is calling all surfers! Watch those YouTube videos so this summer you can take a serious wave ride on the FlowRider®. Get ready to float and relax on the Lazy River. We can't wait for you to visit this summer to soak up some sun and drift along on the Lazy River. From the Lazy River to the FlowRider® — choose your own adventure! Interested in touring the facility in person? Come in anytime and one of our staff will take you around. Relax in your own personal cabana! The Waterpark will open Saturday, May 25, 2019. You are welcome to bring outside food into The Waterpark. Please note that outside food is only permitted in designated spaces throughout the park. Glass and alcohol are prohibited. We encourage you to practice swim and sun safety by applying sunscreen and using puddlejumper and/or a life jacket depending on your swim level. If you forget to bring those items, don’t worry! In addition to our fully-stocked concession stand, we have sunscreen, swim diapers and more available for sale. Life jackets are available free of charge. Where can I sign the FlowRider® waiver? 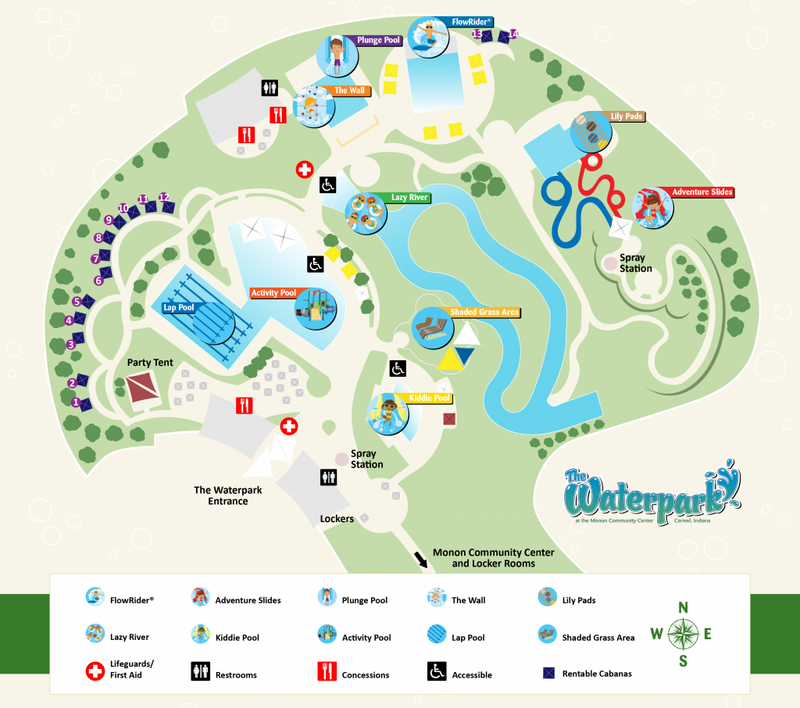 What is the layout of The Waterpark? Oh, Summer How We Miss You (already)! Open Saturday of Memorial Day weekend through Labor Day (May 25-September 2, 2019). Learn to swim no matter your experience level. Individual and group classes are available for kids and adults year-round.